The creation of an industry pledge forms a key part of the Skills Plan for the Welsh food and drink industry. Specifically the strategic aim is to improve the perception and understanding of the food and drink industry in Wales as offering an exciting career of choice, and as such the focus of the pledge is around encouraging businesses to support activity to improve the image of the industry as an exciting place to work. Welsh Government already supports a number of initiatives which are successful. The aim of this skills plan is to drive wider uptake and activity such that the sector creates a positive shift in the perception of the industry. In addition, the proposal is that current activity, which is mainly focussed on the food manufacturing sector, is expanded to encompass companies throughout the food supply chain. available in the food supply chain. There are a range of opportunities, supported financially by Welsh Government, through which companies can undertake activity. Support a School’s Challenge - coming soon! Help a local school by judging their design & technology challenge to design a new product fit for future generations. Promotion of the industry - work with local food festivals and community events. Skills Cymru - join with other food companies and attend the Skills Cymru careers events in Llandudno and / or Cardiff to showcase your company and the exciting roles in them. Ensure that all members of staff commit to at least one development / training initiative in the next year. 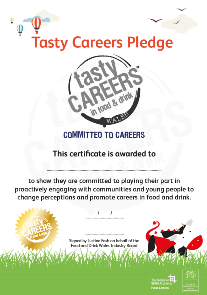 Companies will be signing up to being ‘Committed to Tasty Careers’ which means they commit to undertake one or more of these activities each year for 3 years. After signing they will receive a visit from Tasty Careers Wales and have all the options available explained to them and select the most appropriate for their organisation. They will also receive a certificate to signify their involvement and a logo to use on their website. Their involvement will be monitored and PR case studies produced and publicised. This will be used by WG to promote the industry at trade events and highlighted at Taste Wales. All companies benefitting from any Welsh Government support will be expected to commit to this activity as part of their agreement. Act and the Economic Action Plan.